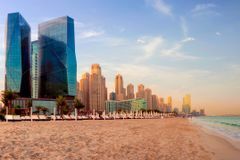 Rixos Premium Dubai is located in the perfect spot in the heart of Dubai's Jumeirah Beach Residence, with more than ideal access to walking straight out onto the beach or onto a strip of restaurants and shops. From the rooms, you can experience panoramic views overlooking the beach alongside the world's largest Ferris Wheel, The Dubai Eye, from the 35 stories available. Rixos Premium Dubai offers 414 stylish rooms and suites with direct access to the beach as well as a total of 9 restaurants and bars. With 35 stories available to guests, it's fair to say Rixos offers some of the best panoramic views across Dubai to enjoy throughout the stay. There is also the Natureland Spa to be able to wind down after a day exploring or on the golf course.